The City of North Ridgeville entered into contract with Lorain County Commissioners, administered by Lorain County Office of Emergency Management and Homeland Security, to provide the city and county with a robust, cost-effective emergency notification system. 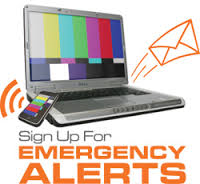 The service is free to residents to subscribe to receive alert messages by way of voice, text, and/or e-mail. To subscribe, click the icon below.